Network Security is devoted to solving your network security issues in detail, now with even more news, information and solutions to your network security problems. Subscribe today and identify the threats to your networks. 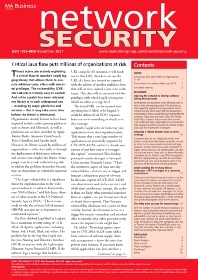 • Authoritative news and analysis of significant events, including major trends in threats, attacks and regulatory changes. • Regular columns – the inside view from our panel of experts. • Detailed articles providing real-world guidance on key network security issues. • In-depth analyis of the management, regulatory and policy challenges around information security, data governance and regulatory compliance. • Technically detailed updates on developments in key network and IT security technologies. • Book reviews and a comprehensive calendar of events. • Penetration testers and ethical hackers. ?